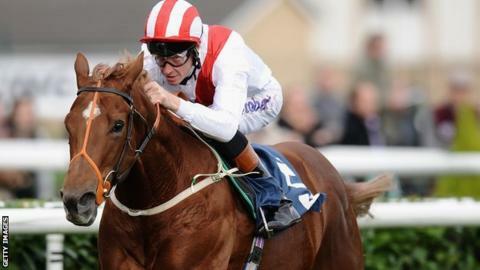 Richard Hughes says he planned to continue racing as normal after unknowingly breaking his back in a fall in Dubai. He was riding the Mike de Kock-trained Mars in the Sheema Classic on 29 March when his mount crashed through a rail, throwing Hughes over the top. The 41-year-old was encouraged to get an X-ray by his team, and the scans revealed he had broken a vertebrae. "I thought it was just a bit sore," Hughes told BBC Wiltshire. "I didn't seem bad enough to have an X-ray. If I hadn't gone for it, I'd be riding now." Hughes was crowned champion jockey for the second consecutive season in November. He also became the first jockey to ride more than 200 winners in a British flat season since Kieren Fallon in 2003, notching 208. Following his fall, Marlborough-based Hughes was told he would be out of action for three months but the Irishman is already planning his return to race at Sandown on 25 April. "When I came back here [to Wiltshire] I went to see a specialist, hoping to ride this weekend, but he said if you take a chance and have a fall you won't be walking back in here," he added. "So I took his advice and I will take an extra couple of weeks. "I'll have another X-ray on 23 April and as long as that is clean, I'll ride on two days later."